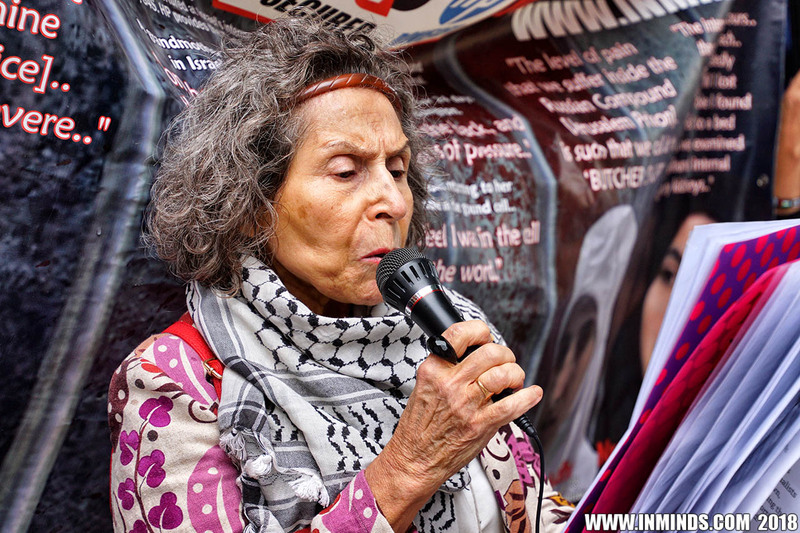 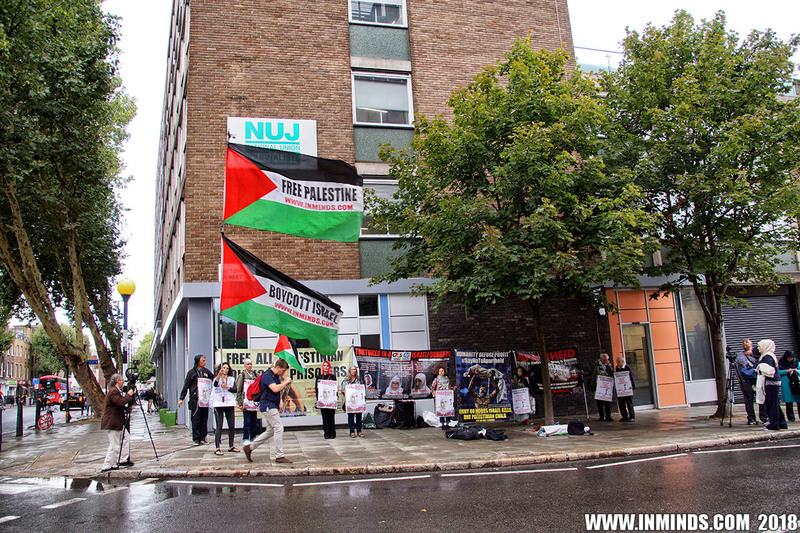 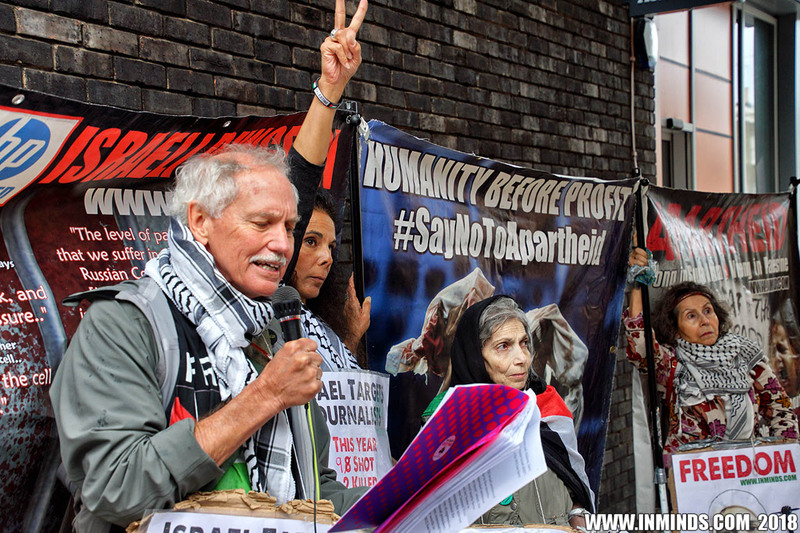 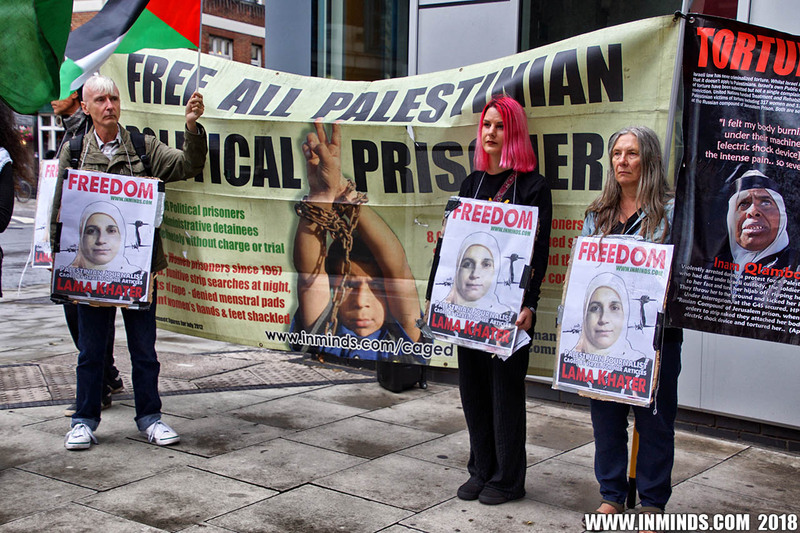 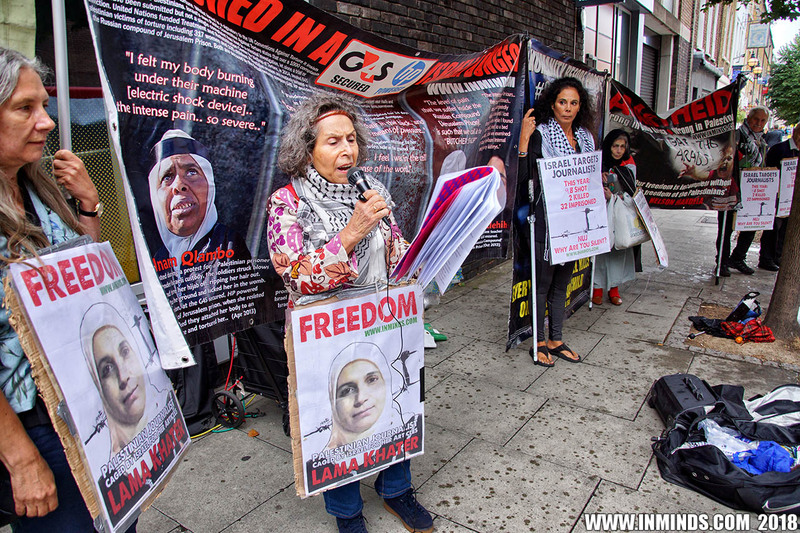 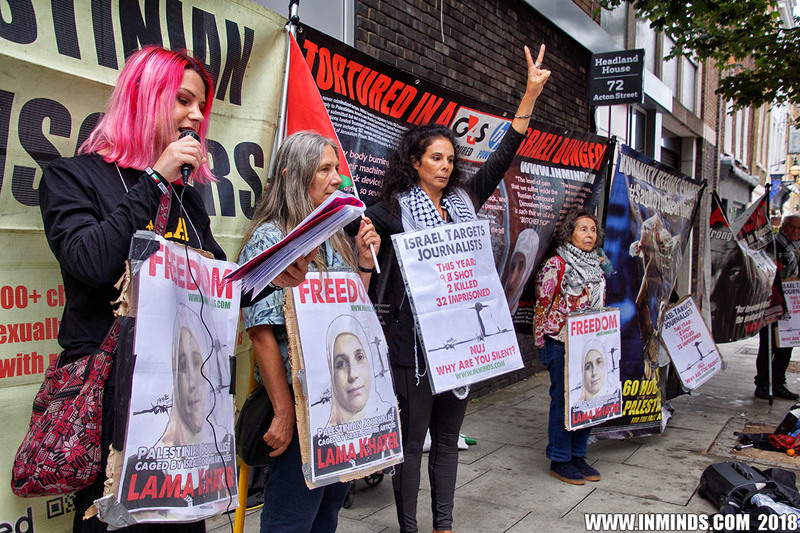 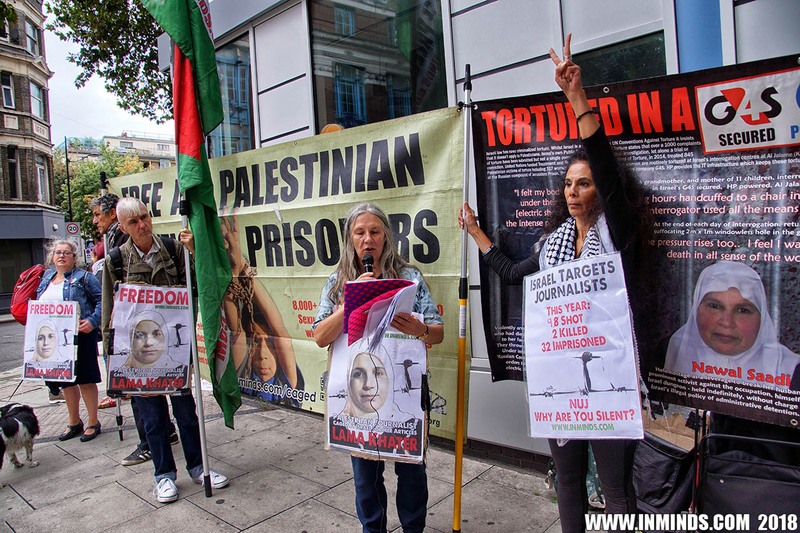 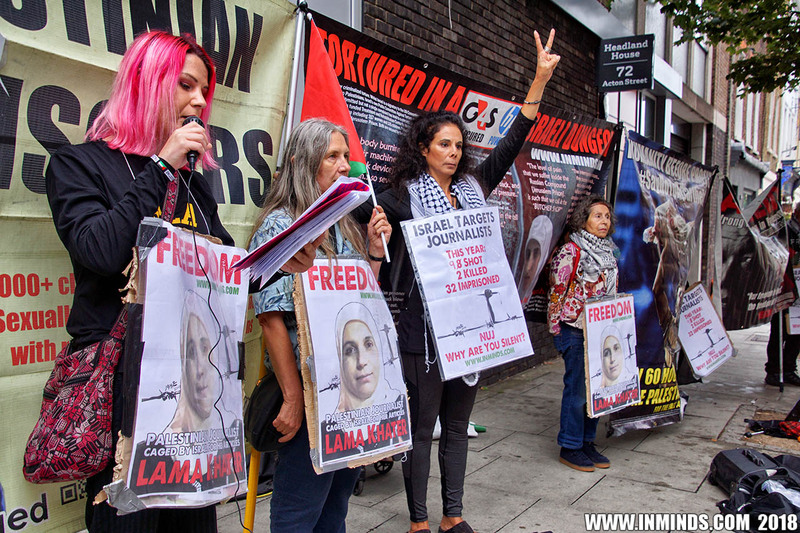 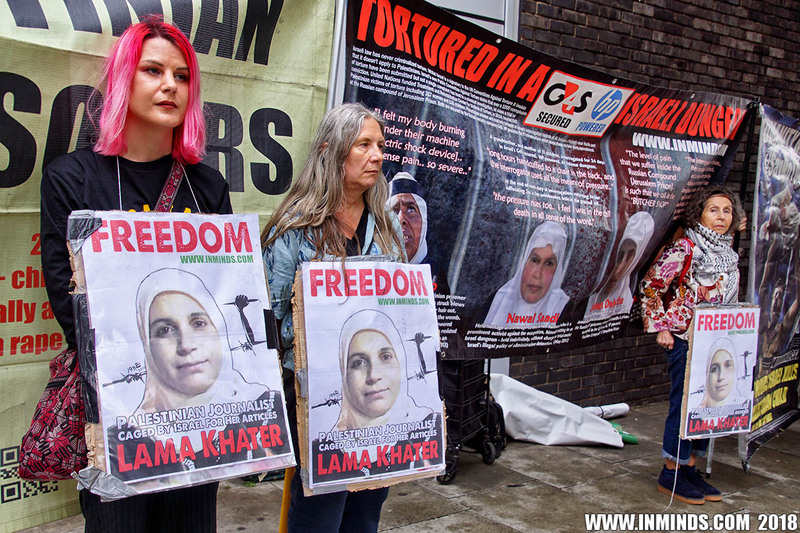 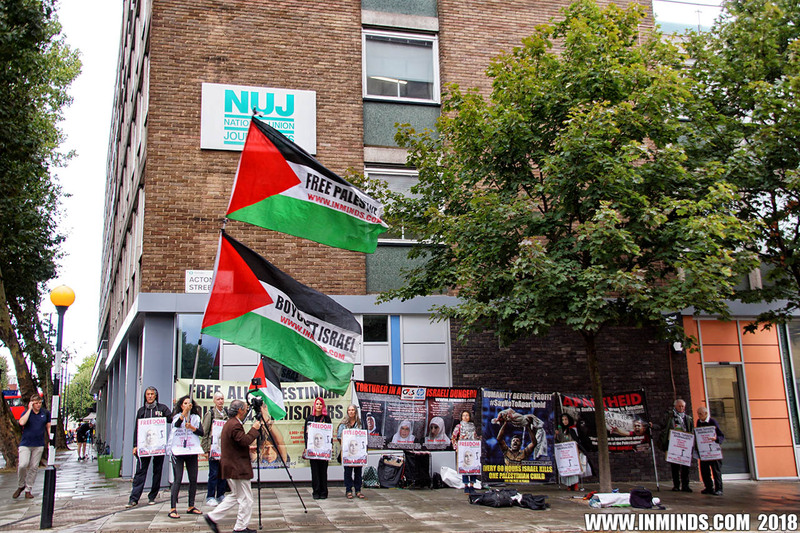 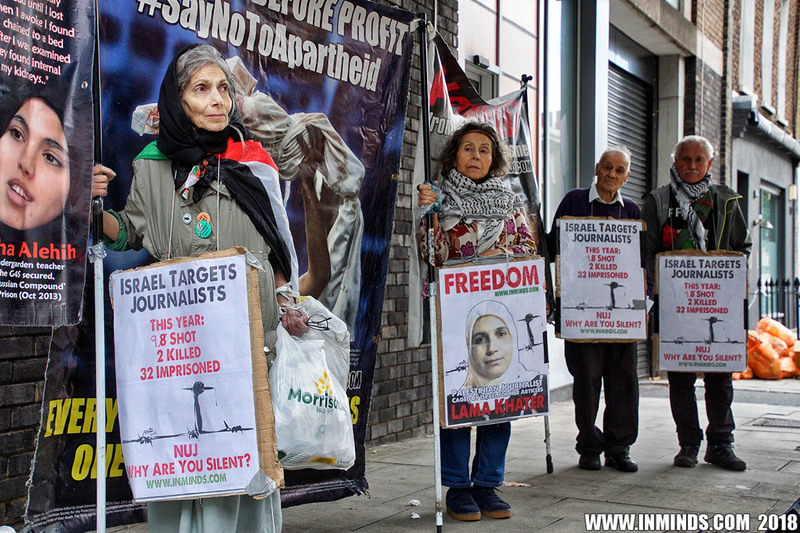 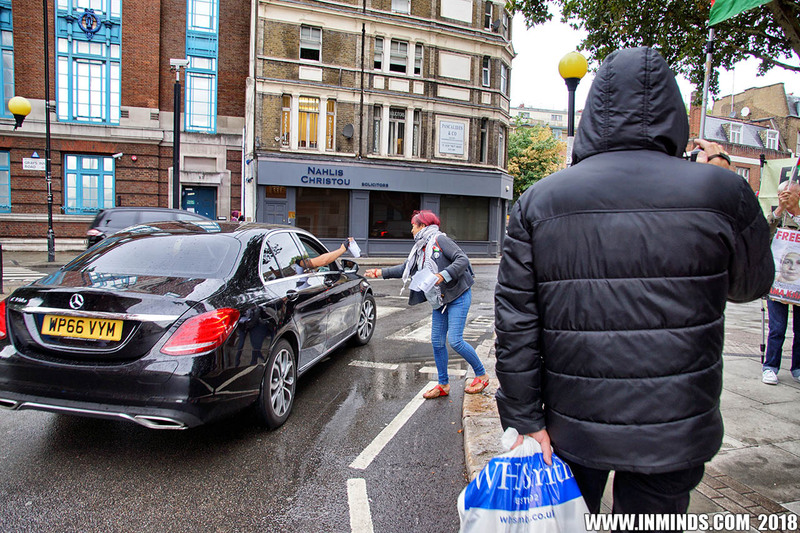 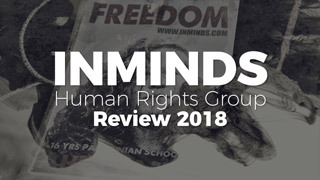 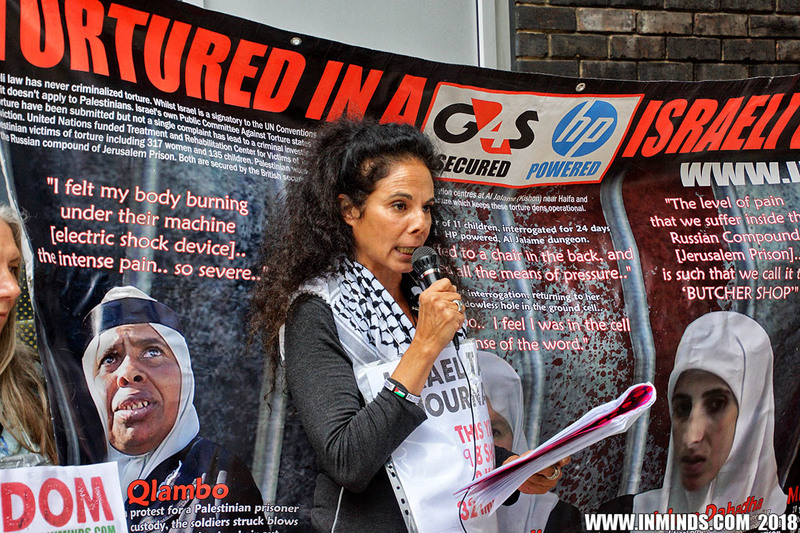 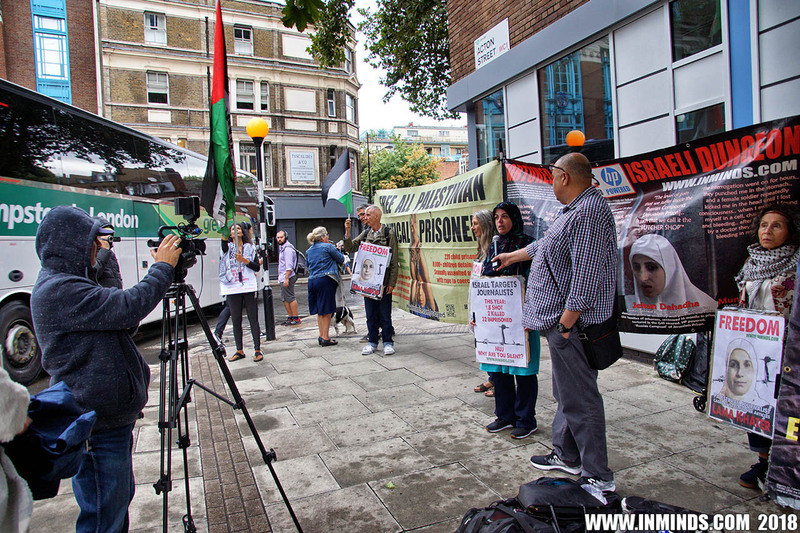 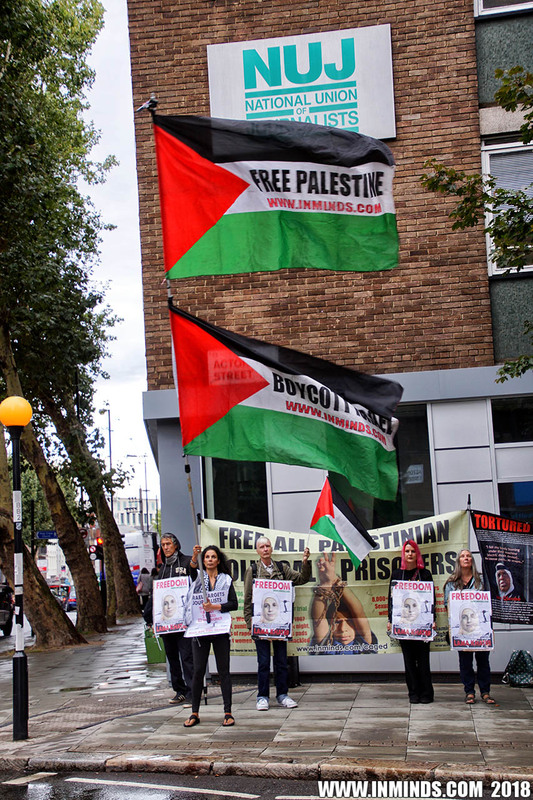 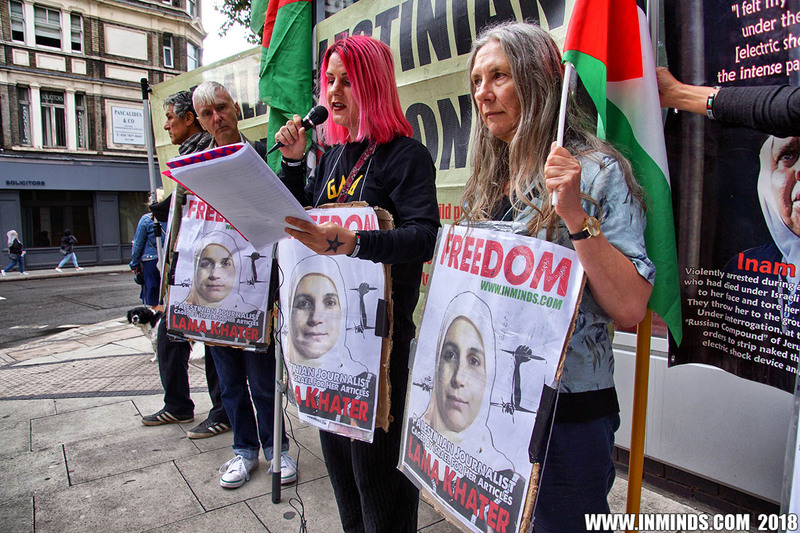 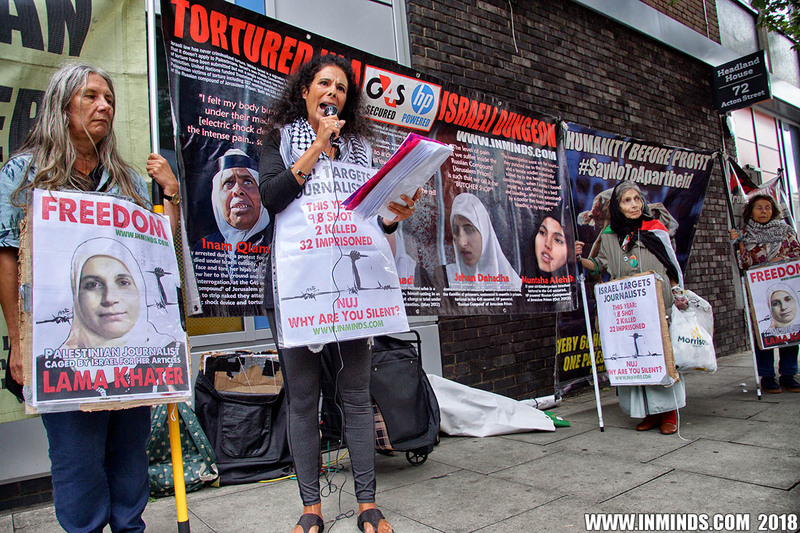 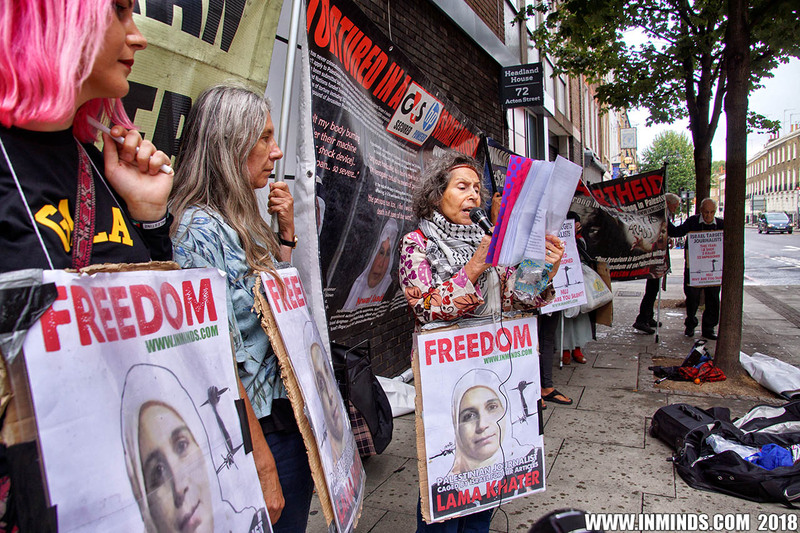 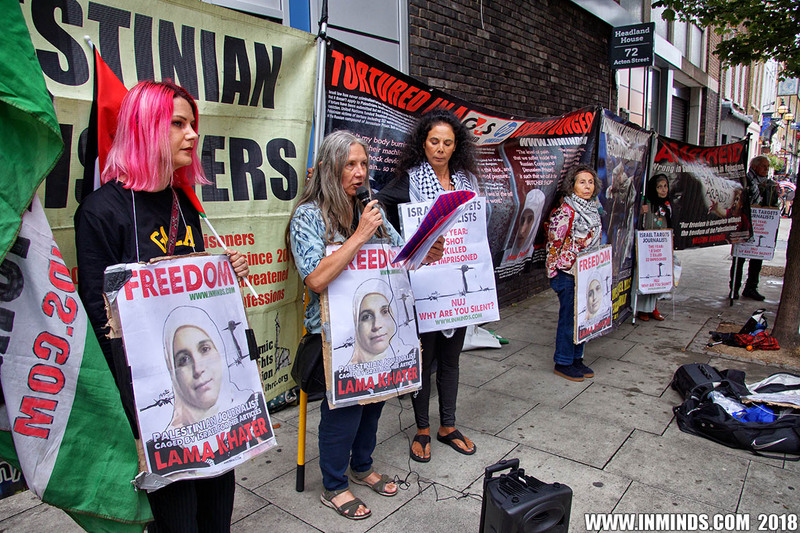 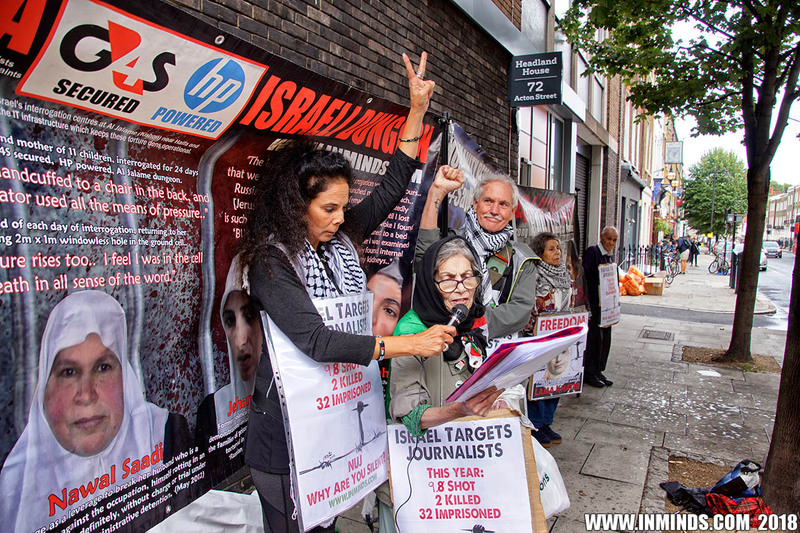 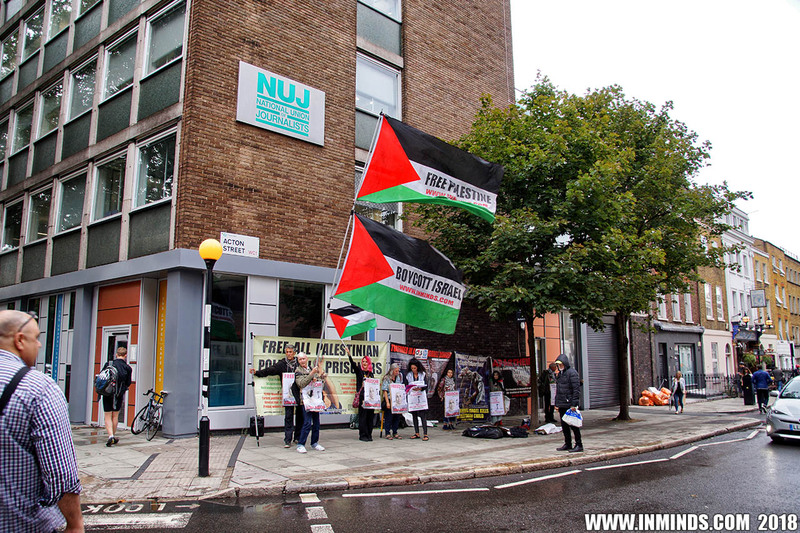 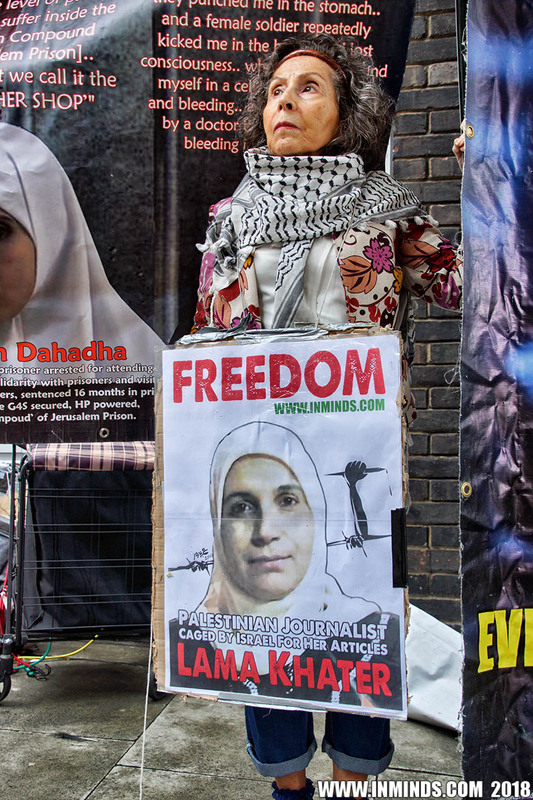 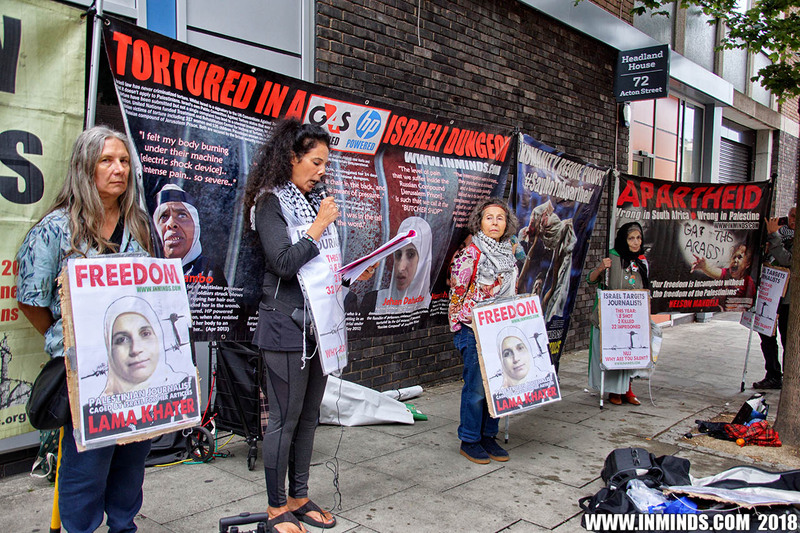 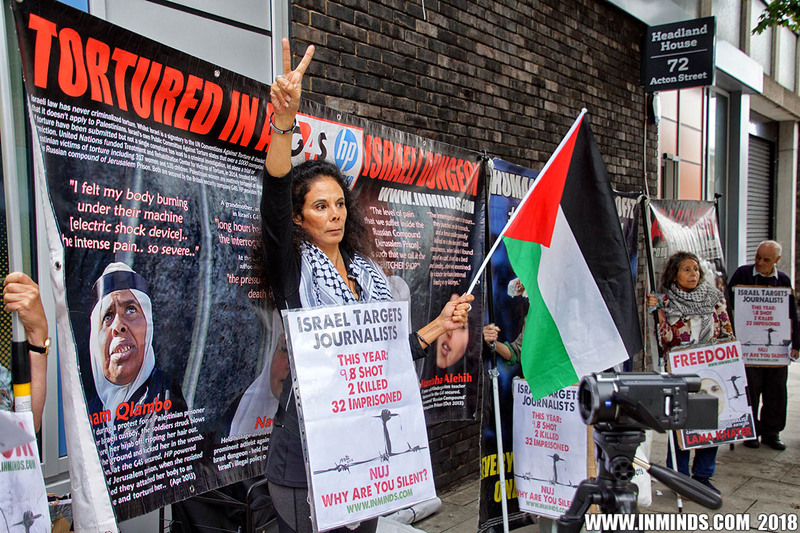 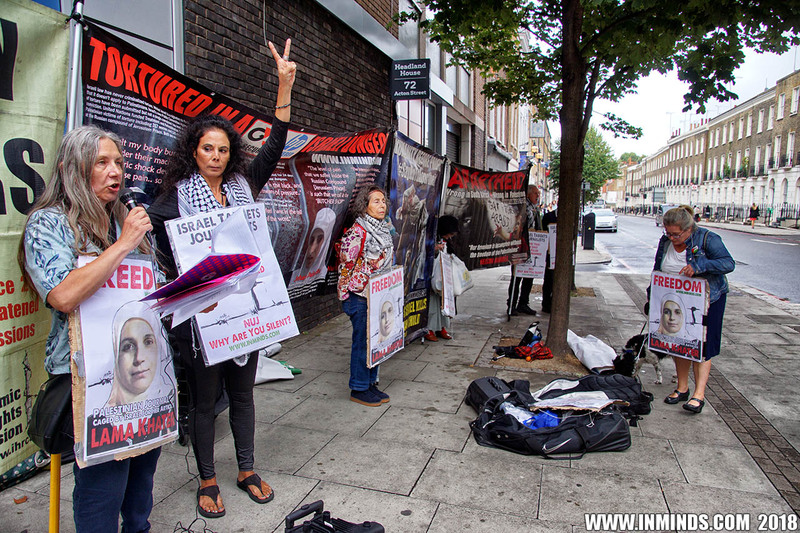 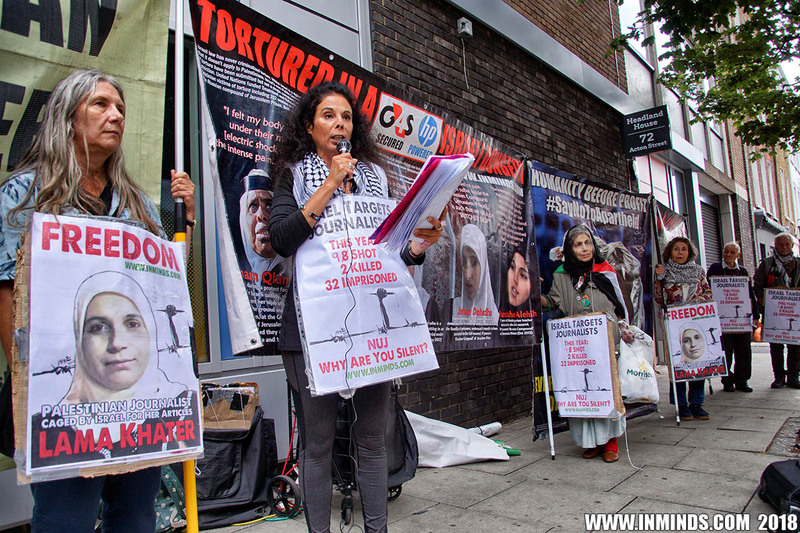 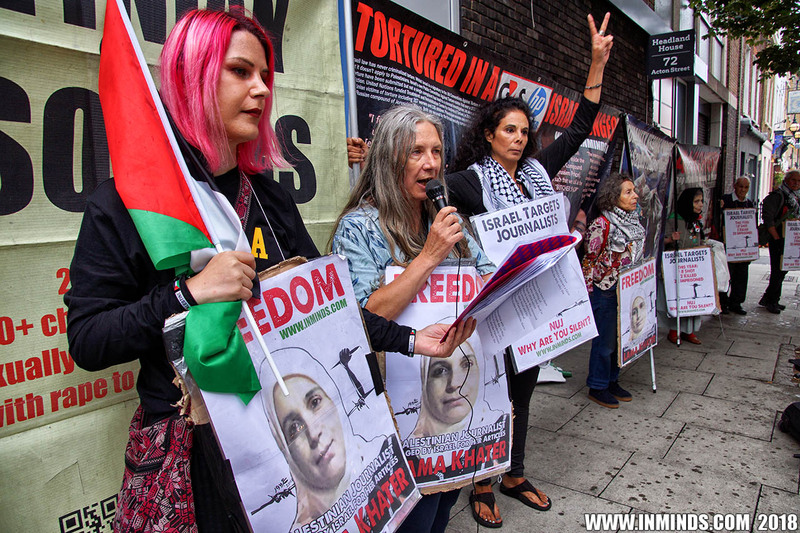 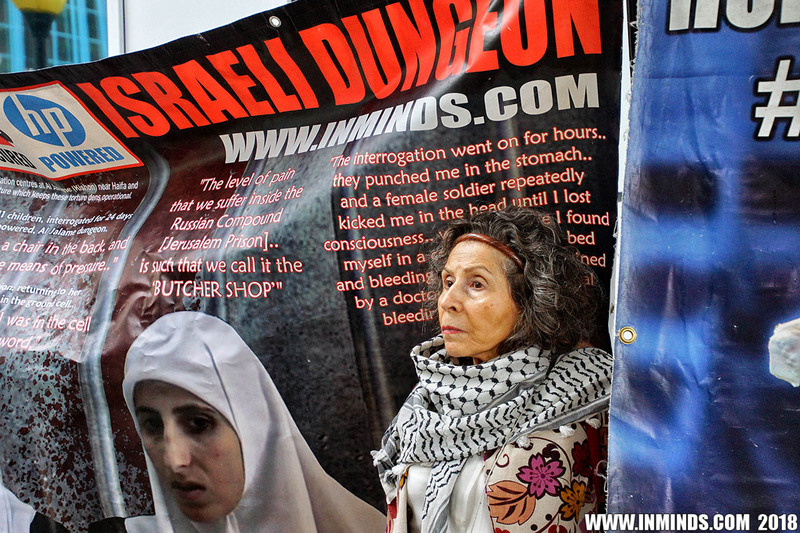 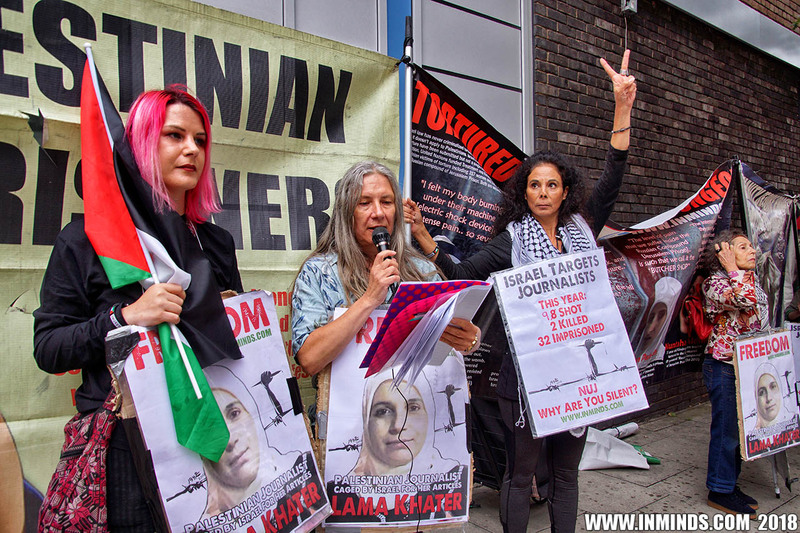 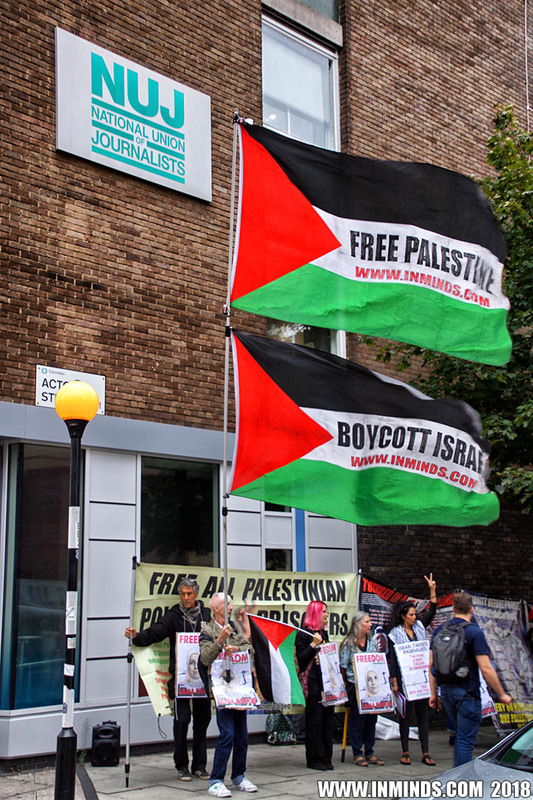 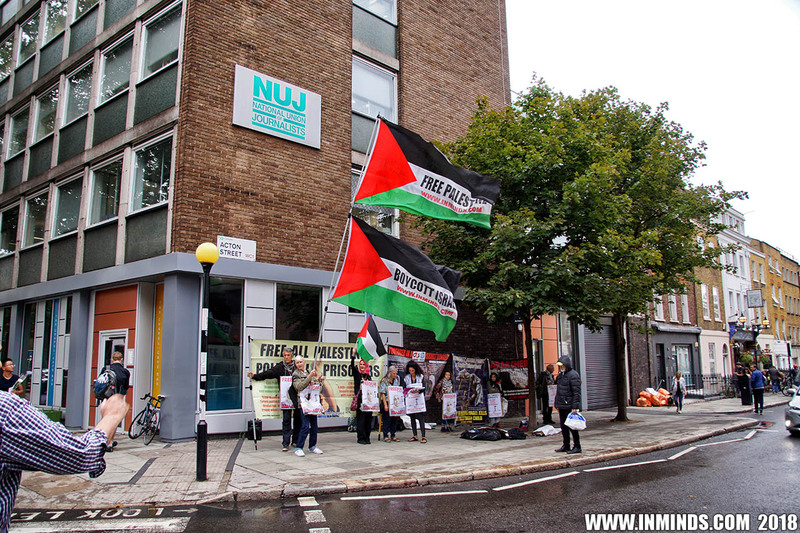 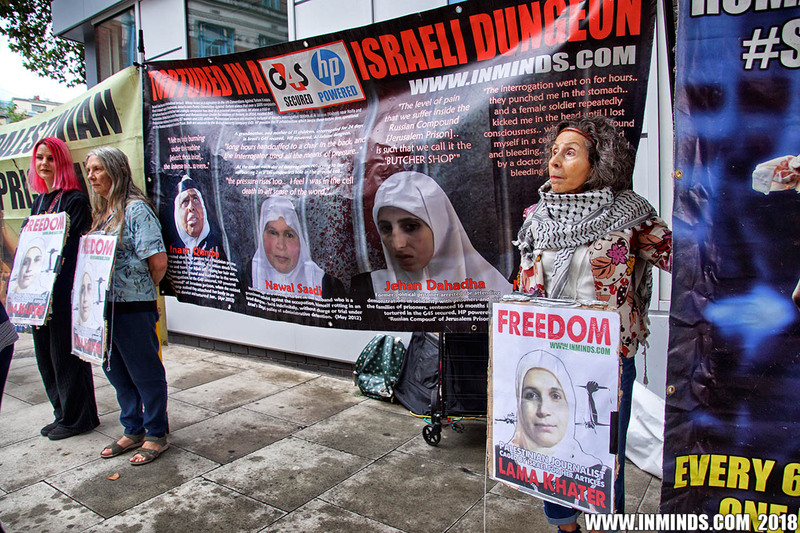 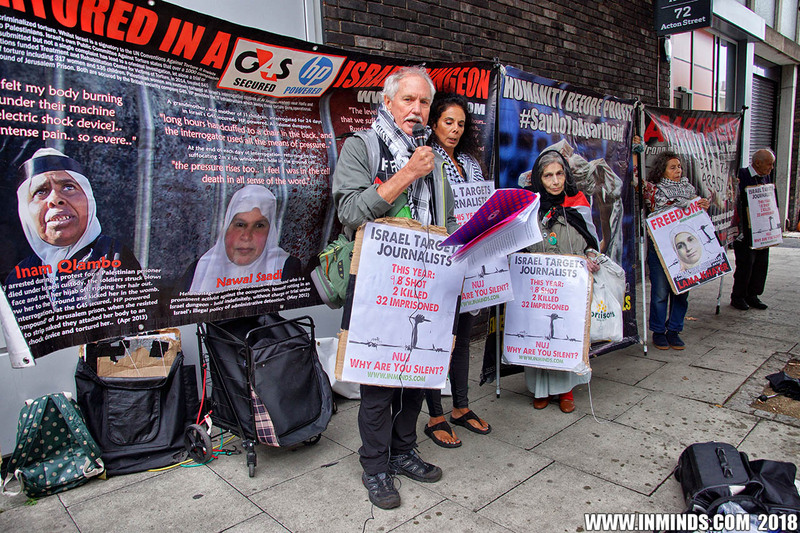 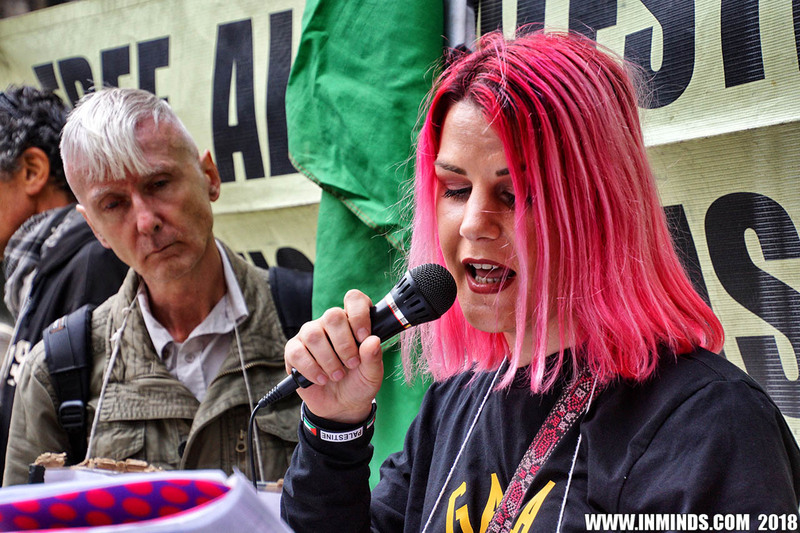 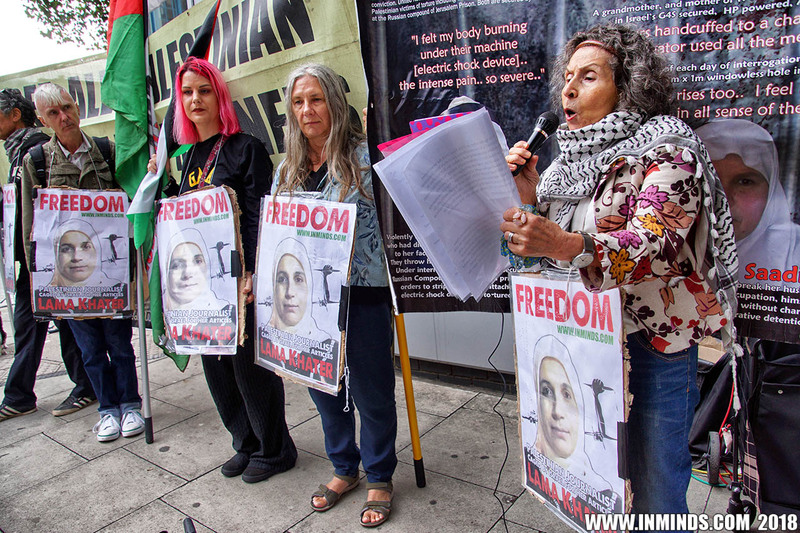 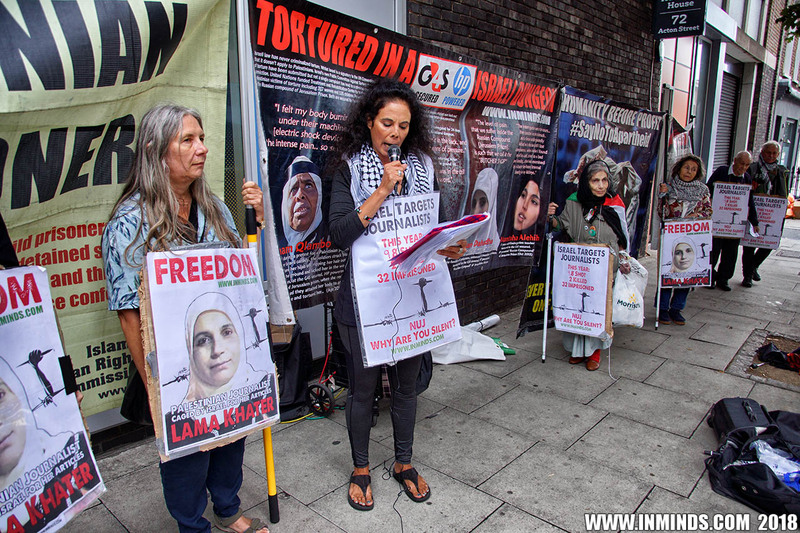 On Friday 24th August 2018 Inminds human rights group held a vigil outside the headquarters of the National Union of Journalists (NUJ) in London to protest the NUJ's silence at Israel's targeting of Palestinian journalists, and to demand freedom for tortured Palestinian journalist Lama Khater. 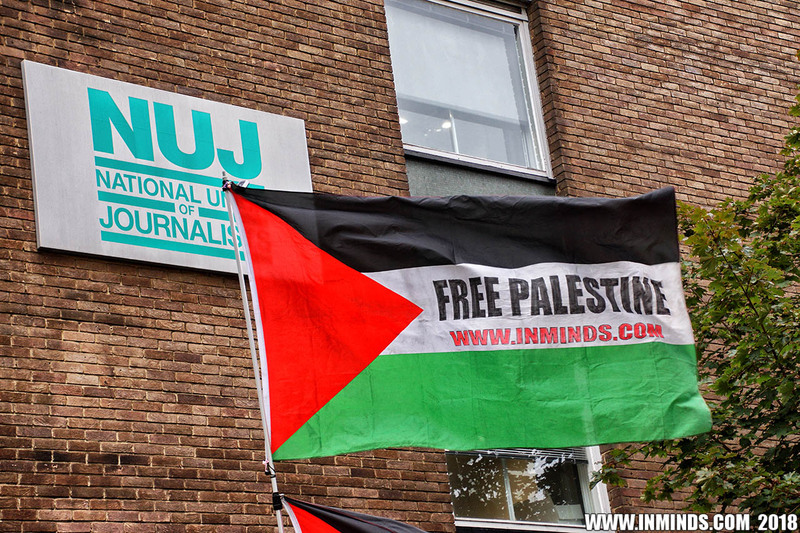 A letter was handed in to the NUJ asking the NUJ to support fellow journalists in Palestine that are under attack by the Israeli occupation. 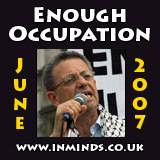 Inminds chair Abbas Ali said "When we look at the NUJ's recent record we see it has overwhelmingly stayed silent when Palestinian journalists are targeted by Israel, their media outlets closed down, draconian laws passed stopping them from performing their duty, journalists arrested and tortured for their reporting, and even being targeted by Israeli snipers and killed. 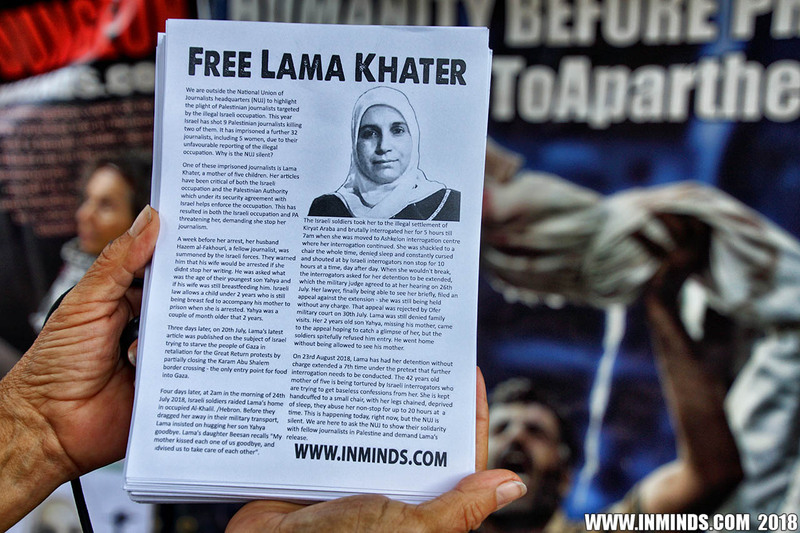 This is in sharp contrast to NUJ actions elsewhere - this month the NUJ is campaigning for the release of a journalist in Bangladesh, and last month for the release of a journalist in Egypt, and it has launched a huge poster campaign on behalf of the BBC Persian Service, a service which was funded by the British Foreign and Commonwealth Office, after it was criticised by one media outlet in Iran of acting against the interests of Iran.. but not one word for Palestinian journalists like Lama Khater, a mother of five, who has been caged by Israel since 24th July for her journalism, and is currently being tortured, up to 20 hours a day, to extract a false confession from her. 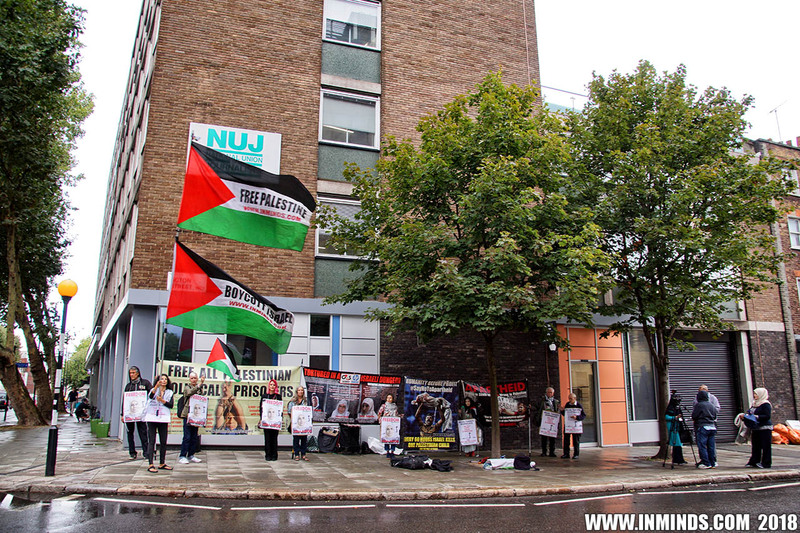 We are here to ask the NUJ, why the double standards? 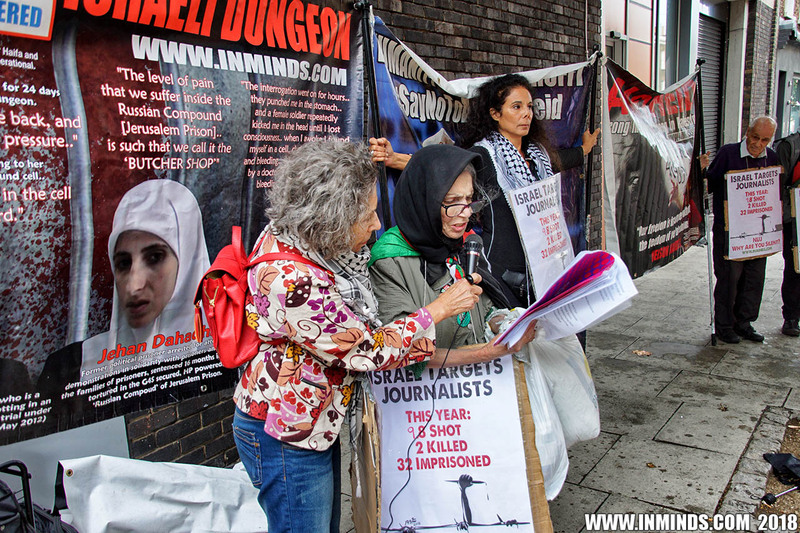 Its time for the NUJ to defend the rights of Palestinian journalists, starting with a condemnation of the abduction, caging and torture of Lama Khater and a demand for her release." 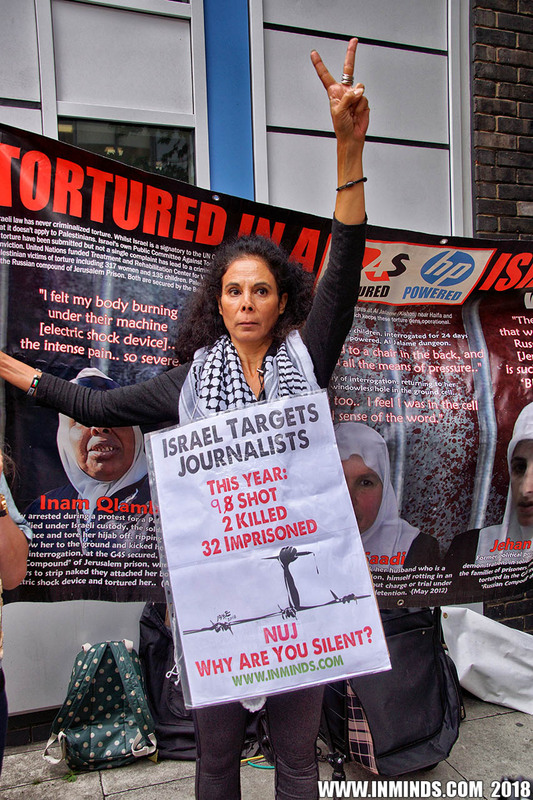 Israel is systematically targeting Palestinian media and journalists. 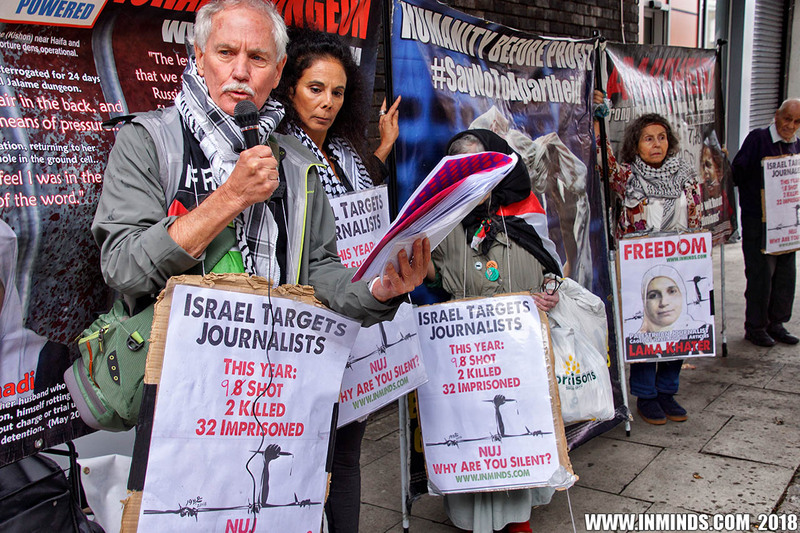 This year Israeli occupation forces have so far shot 9 Palestinian journalists killing two of them, and has imprisoned a further 32 journalists, including 5 women, due to their reporting of the illegal occupation. 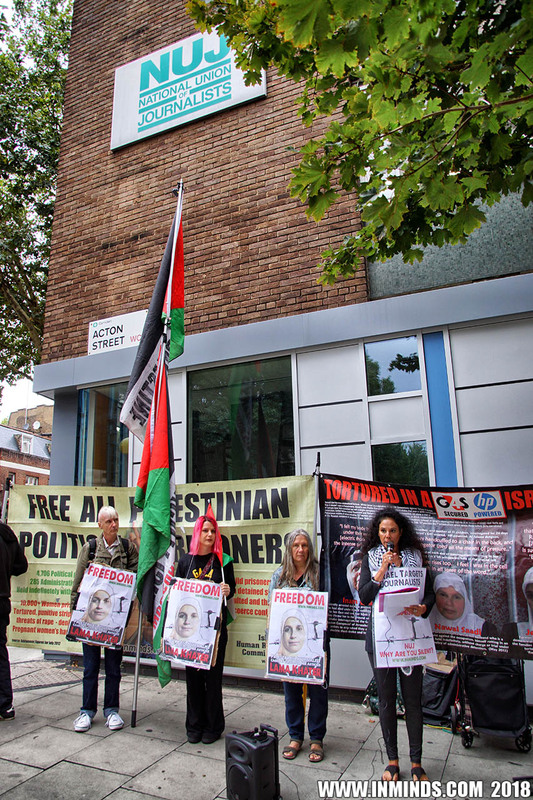 This number does not include Palestinian writers and poets like Dareen Tatour who was sentenced to five months imprisonment simply for writing a poem. 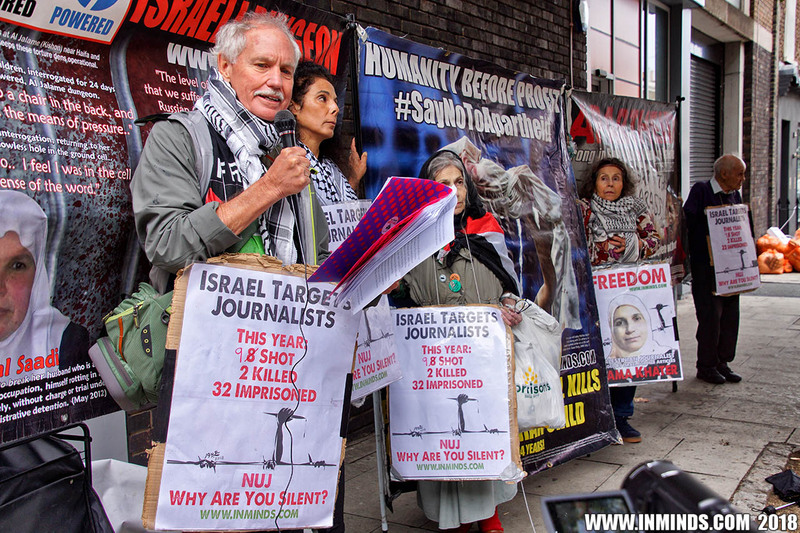 When we look at the NUJ's recent record we see it has overwhelmingly stayed silent when Palestinian journalists are targeted by Israel, their media outlets closed down, draconian laws passed stopping them from performing their duty, journalists arrested and tortured for their reporting, and even being targeted by Israeli snipers and killed. 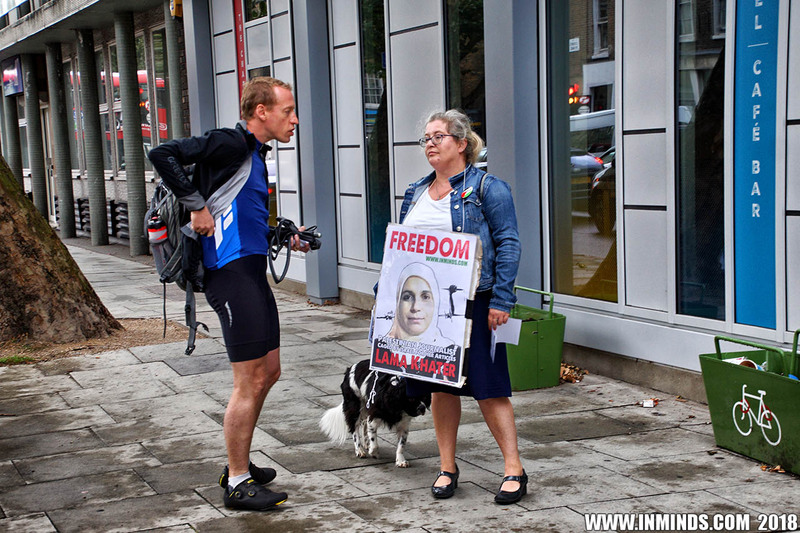 This is in sharp contrast to NUJ actions elsewhere - this month the NUJ is campaigning for the release of a journalist in Bangladesh, and last month for the release of a journalist in Egypt, and it has launched a huge poster campaign on behalf of BBC Persian Service after it was criticised by one media outlet in Iran of acting against the interests of Iran.. but not one word for Palestinian journalists like Lama Khater who has been caged by Israel since 24th July for her journalism, and is currently being tortured to extract a false confession from her. 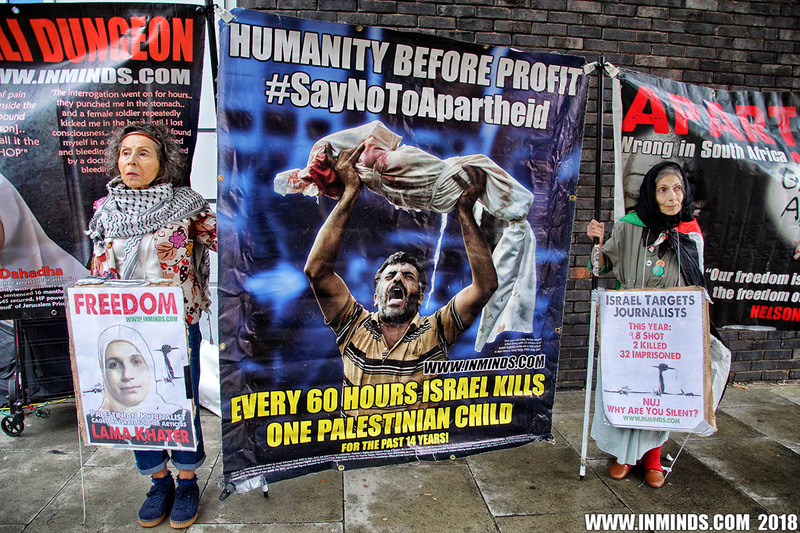 Why the double standards? 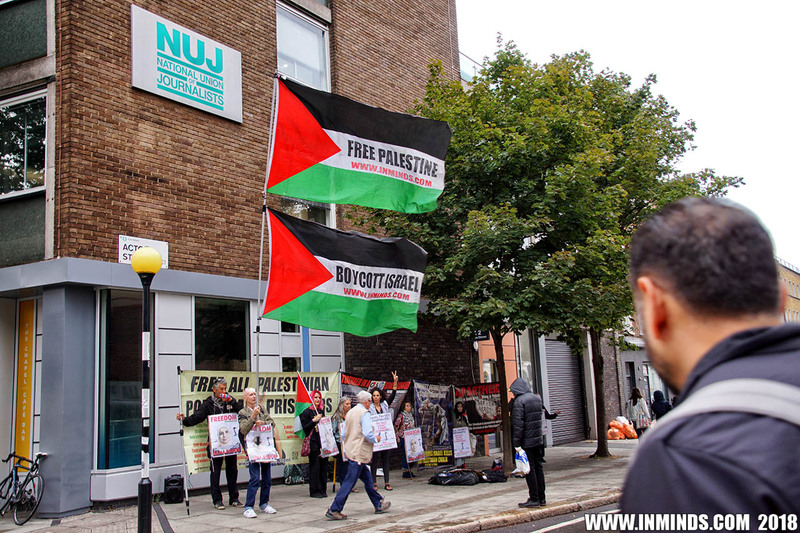 The only recent exception to NUJ’s silence has been their rightful condemnation of Israel's targeted killing of Palestinian journalist Yasser Murtaja, who was shot dead in cold blood by Israeli snipers on 6th April 2018 whilst covering the March of Return protests in Gaza. 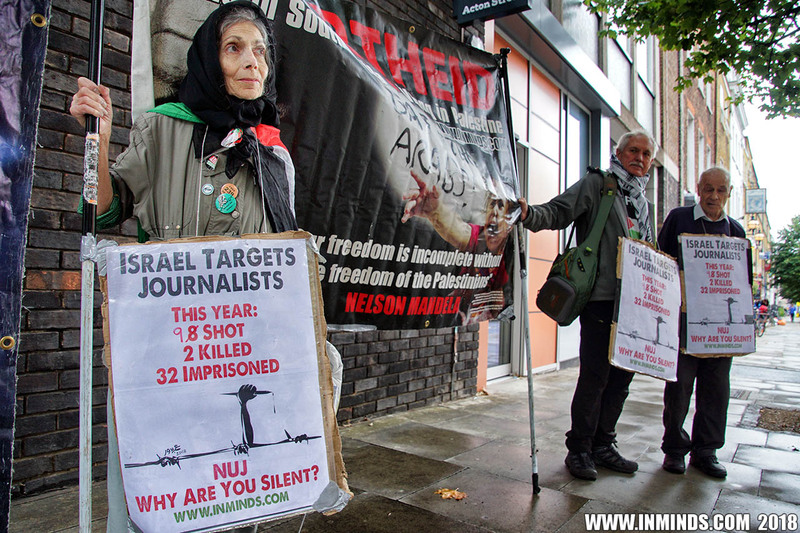 We commend that, but just a few days later when a second Palestinian journalist, Ahmad Abu Hussein, was shot dead and his murder condemned by the International Federation of Journalists (IFJ) and other journalist bodies worldwide, there was silence from the NUJ. 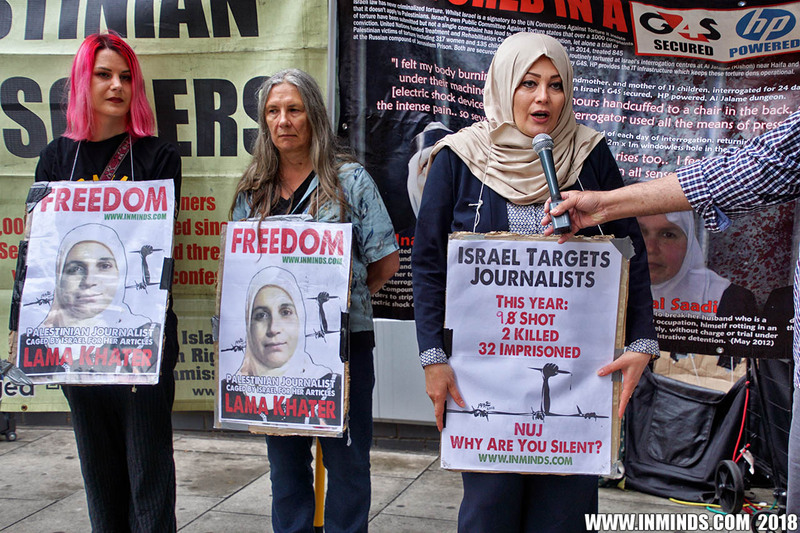 Similarly when the shooting spree intensified with 13 journalists being injured by Israel on a single day on May 14th, with the International Federation of Journalists (IFJ) , the Federation of Arab Journalists (FAJ), and the Palestinian Journalists Syndicate (PJS) all strongly condemning it, the NUJ was again silent. 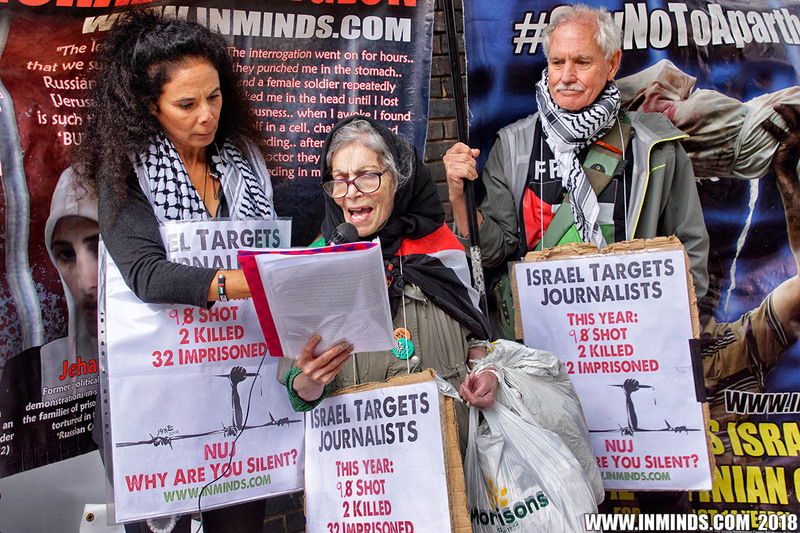 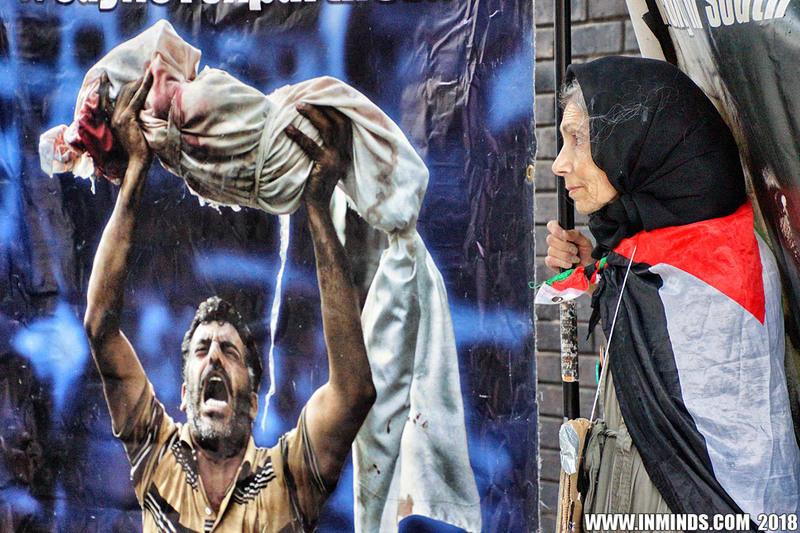 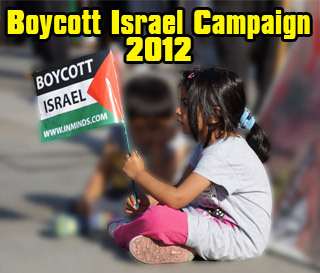 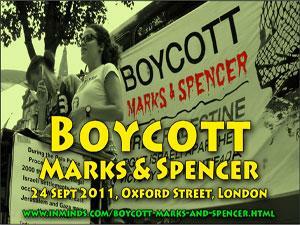 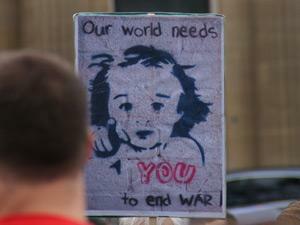 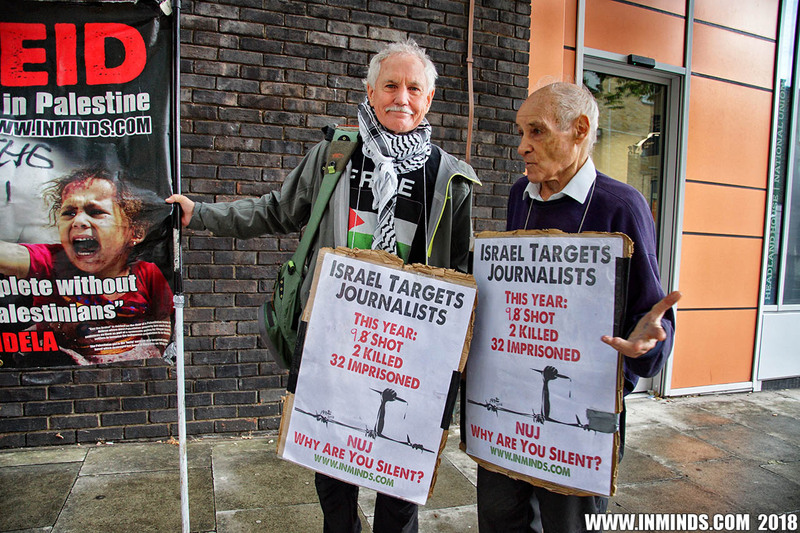 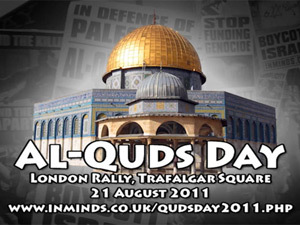 Isn't it time for the NUJ to break its silence and heed the call from Palestinian journalists for solidarity? 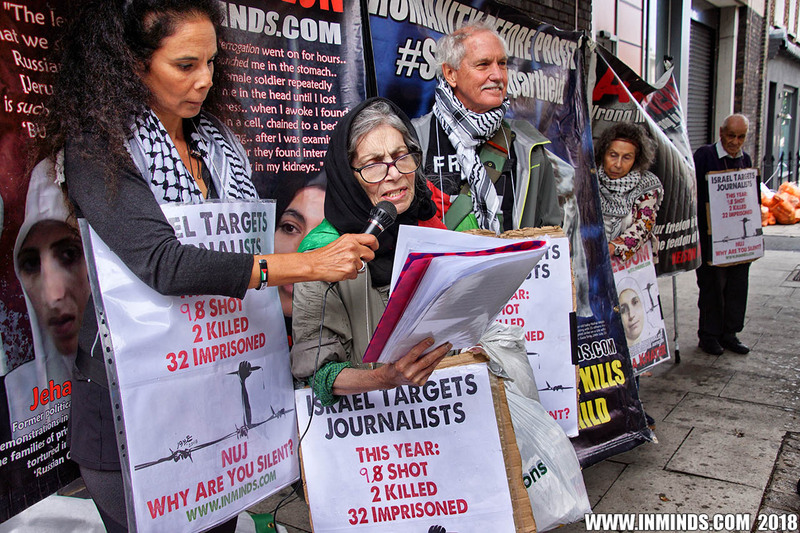 Isn’t it time for the NUJ to defend the rights of Palestinian journalists, starting with issuing a strong condemnation of the abduction and torture of Palestinian journalist Lama Khater? 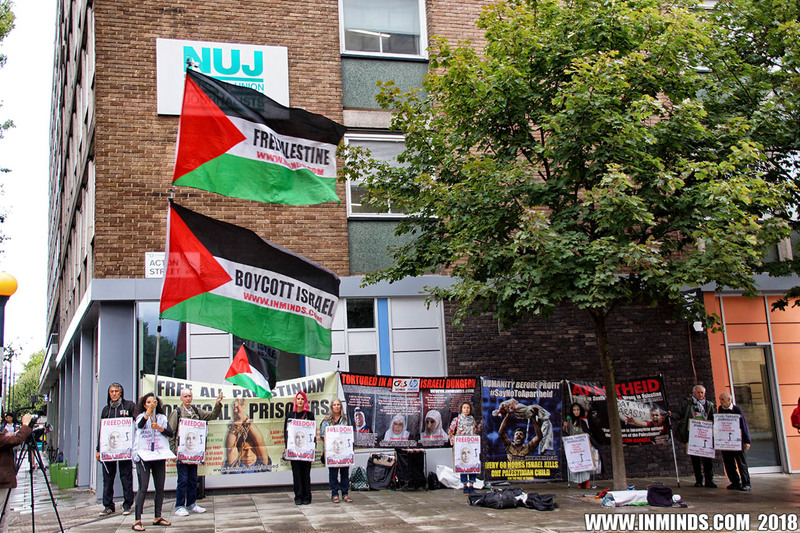 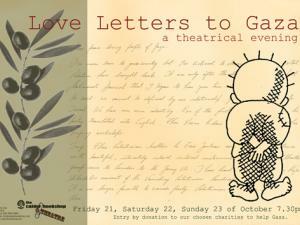 We have still not received a reply to the letter we hand delivered to NUJ over 3 weeks ago. 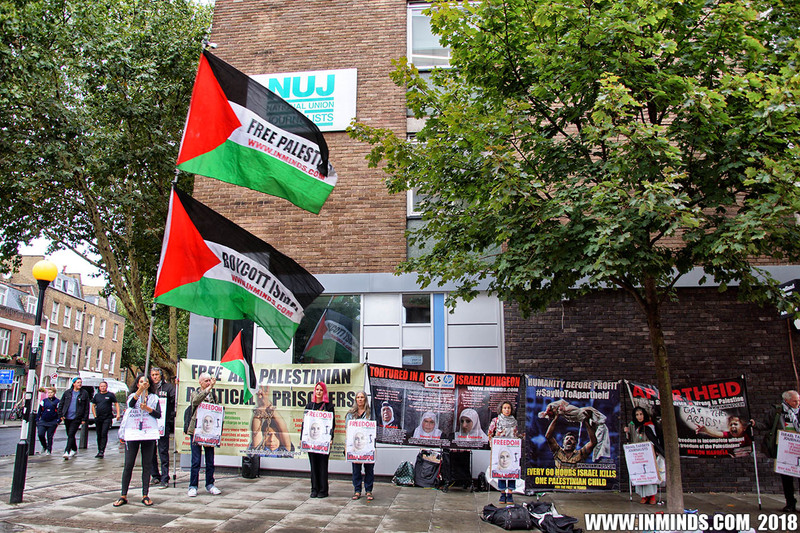 Two weeks after our protest, on 7th Sept 2018, the NUJ joined with the International Federation of Journalists (IFJ) and its affiliate, the Palestinian Journalists Syndicate (PJS), in strongly condemning the Israeli army's attack on Palestinian journalists who held a protest near Ramallah on Tuesday 4 September 2018. 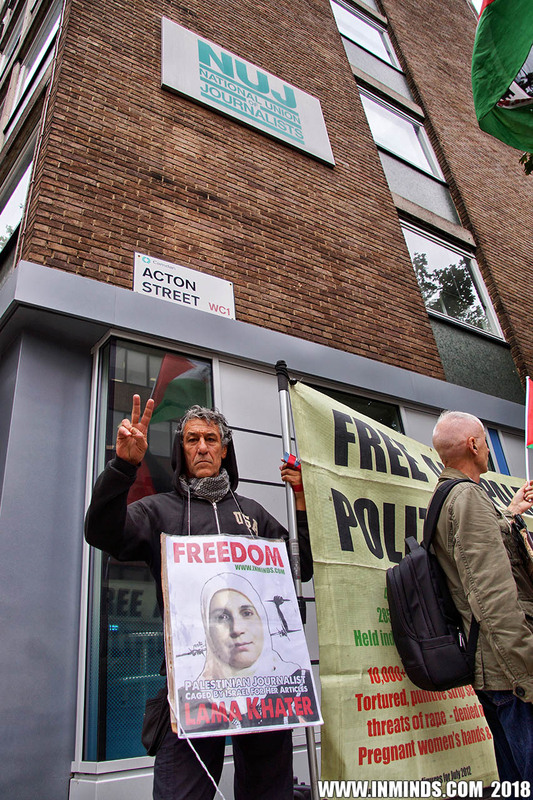 The protest was an act of solidarity with Ali Dar Ali, a Palestine TV correspondent, who appeared on the same day before an Israeli military court. 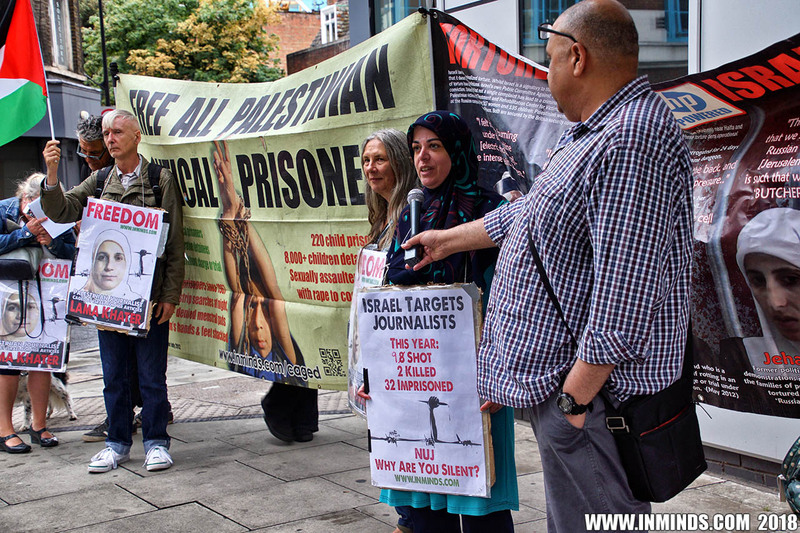 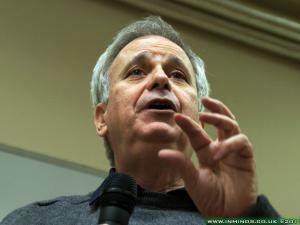 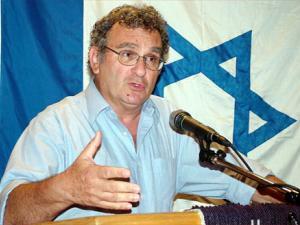 CORRECTION: On 4th July 2018, The NUJ did host a public meeting in parliament where the president of the Palestinian Journalists’ Syndicate, Nasser Abu Bakar, was invited to talk about Palestinian journalists under attack. 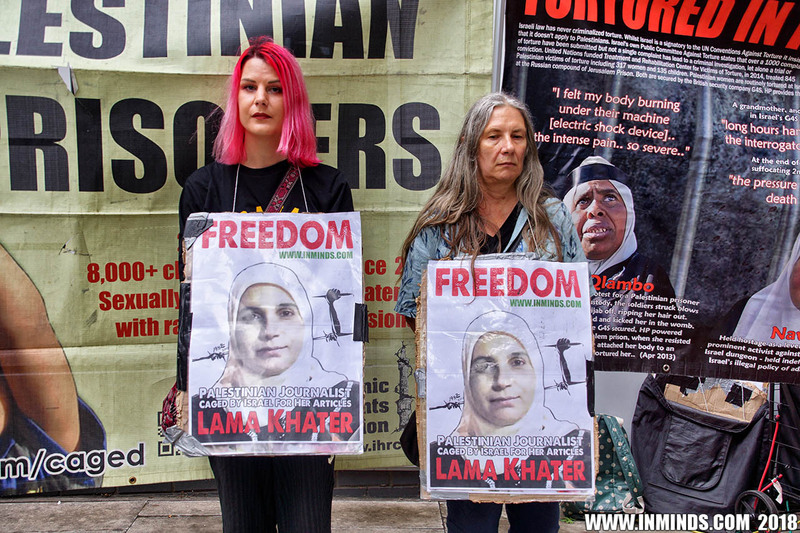 We commend the NUJ on both these actions, but request that they also look at the case of Palestinian journalist Lama Khater, international condemnation from the NUJ could save her from further torture..